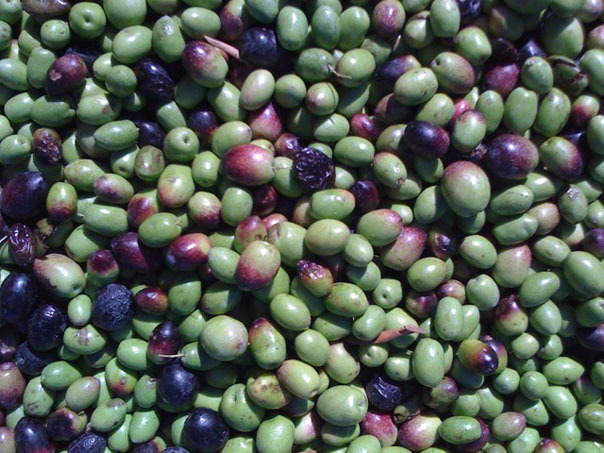 Every year, Caltech harvests the olives from 130 olive trees on campus in Pasadena, CA. 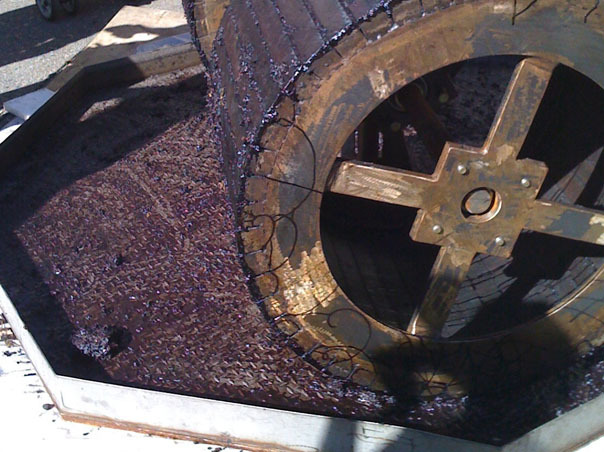 They send most of the harvest to a local company to press and bottle, but there are some dedicated students who press olives immediately, creating a gorgeous purple goo from which the freshest olive oil can be skimmed. Many California vendors, including Trader Joe’s, sell olive oil produced here in California. Roasting lets you cook things pretty hot and fast. If you include the time it takes to bring water to boil, it can be faster than boiling. I think it also holds in more nutrients, and to my tongue, roasted veggies taste better than steamed. The balance with roasting is to make sure the veggies are cooked through and are nicely browned on the outside. To that end, some of the items here are steam-roasted. This involves covering for the first part of the cooking (to steam them in their own water), then uncovering for the last part (to brown the outside). We also achieve the balance by varying the temperature. In general, smaller, less dense items are cooked at higher temperatures, and bigger, denser items are cooked slow and low. So, if you ever want to speed any of these things up, just chop your target food into smaller pieces and increase the oven temp. The only danger is that the food might dry out too much if chopped too small. When it’s not mentioned, this guide assumes you will toss the vegetables in question with generous quantities of olive oil, salt, and pepper. If you don’t, you’ll be disappointed for sure. 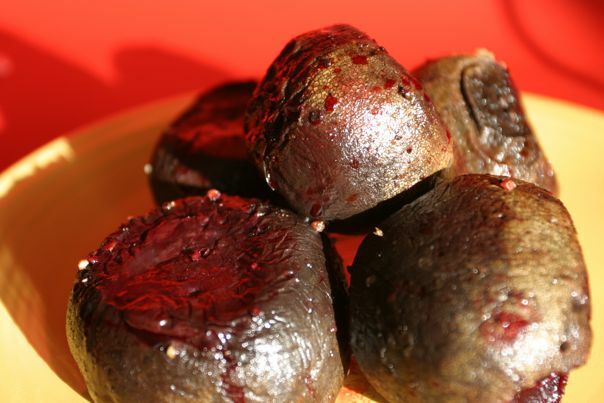 garlic per pound of beets. Do not coat with oil or S&P. Broil skin-side up 3-4 inches from heat until black (it won’t take long). Place in a plastic bag for a few minutes to steam, then the skin should fall right off. Roasted garlic keeps for a month refrigerated, and it lends soul to many dishes. 1. Heat oven to 350 degrees. Remove outermost layers of skin and trip the top of the garlic head by 1/2 inch, so the cloves are exposed. 2. Place heads cut-side down in a medium saucepan. Add milk and begin to simmer. Poach over low heat for 10 minutes. Drain & rinse under cold water. 3. Tightly wrap the garlic heads in aluminum foil, and roast until very soft, about 1 hour. 4. Push out the puree and mash if desired. trim, toss with the usual suspects, and spread on a baking sheet. Cook at 450 degrees, 10 minutes, then stir. Cook until shriveled up and deeply caramelized, about another 10 minutes. Organic doesn’t mean what you think. A packaged frozen dinner could be labeled “organic”. On the other hand, produce from a local farmer might not be labeled (no packaging!) or the farmer might not be able to afford USDA certification. Just ask – if you’re not convinced you’re buying something that should be more fresh and healthy, go elsewhere. Chances are that the freshest produce is likely the healthiest – lots of nutrients and vitamins start to break down as food ages, even just by a few days. That’s why corn, for example, tastes sweetest when it’s just been picked. Organic doesn’t mean local or sustainable. Organic does mean, at least in the US, that food hasn’t been irradiated (this might change soon! ), and hasn’t been genetically modified. 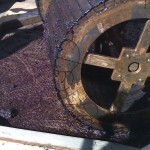 It also means that no chemical means of ripening were used. It has no bearing on locality or sustainability used in producing that food – organic produce could be grown halfway around the world, with techniques that aren’t necessarily sustainable. Brine all the meat overnight. Drain and rinse the meat. Add the meat and stock ingredients to a 20 quart stockpot and add water to cover as much as possible. Bring everything to a boil and maintain a very slow simmer for 3-4 hours, skimming fat as needed, until the stock is very dark. Remove the meat and let it cool. Bring the remaining stock to a rolling boil until it reduces in volume by 1/3, about 2 more hours. Meanwhile, pick off the edible meat from the tongues, head, and trotters. The tongues must be peeled. Work around the bones and skin, judiciously selecting the meat and a little of the fat. The meat should fill one terrine, lined with plastic wrap, with some leftovers. Mix the meat with the parsley or other flavorings. Ladle the reduced stock over the meat to fill the terrine, then salt the entire thing to taste. Cover and refrigerate overnight. 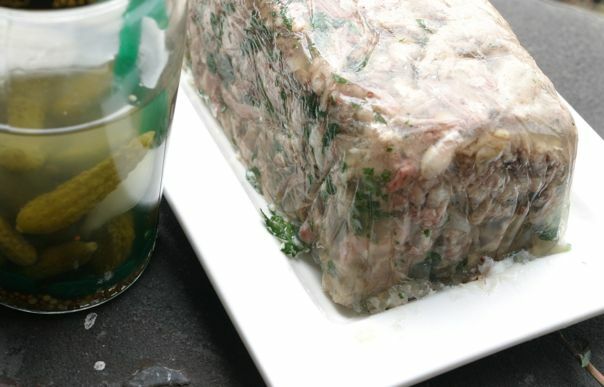 The terrine should be firm all around. Invert onto a serving plate, remove the plastic wrap, and serve with salsa verde, cornichons and other pickled accompaniments, mustards, bread and a salad. Changing your behavior around food, even just a little bit, can help you save money and get healthier. Be conscious of where your food is coming from. If you’re not sure, just ask. Chances are, if it came from close by, it’s fresher, more nutritious, and cost less in burning fossil fuels to get it to you. If it’s in season, it’s probably even cheaper. Shop at your local farmer’s market. Food with no packaging is usually the healthiest food. Grow your own food. See our recommendations for the best low-maintenance plants for your region. Be reasonable, and plant only as much as you think you have time to take care of – even one tomato plant will produce beautiful, ripe treasures. Remember that the freshest and healthiest is not necessarily the most expensive. While the big fancy grocery chains consistently have more information posted about organic vs conventional and where food is produced, the farmer’s market can often beat out both freshness and price. Farmers will almost always volunteer the location of their farm and their practices with pesticides – just ask, and don’t be afraid to shop around for the best-looking product and most honest sounding vendor. You can be sure the seller also has great ideas for how to prepare pretty much anything they have. Fall / Early Winter – this is when you should be planting your beans and peas and anything else that is cold-hardy, as the nightly lows can get into the 30s and 40s. Many herbs will be good here as well, especially cilantro which will definitely not like the hotter weather coming. Likely, you will have success with leafy veggies as well – lettuce, chard, beets, kale, etc. Fall is a great time to plant alliums like onions and garlic, as well as tubers (although potatoes can be rather finicky). Late Winter / Early Spring – plant your hot-weather lovers, like tomatoes, squash, cucumbers, eggplant early! You’ll be glad you did – they’ll be producing early, and will love all the full sunshine once they’ve established a good root system. 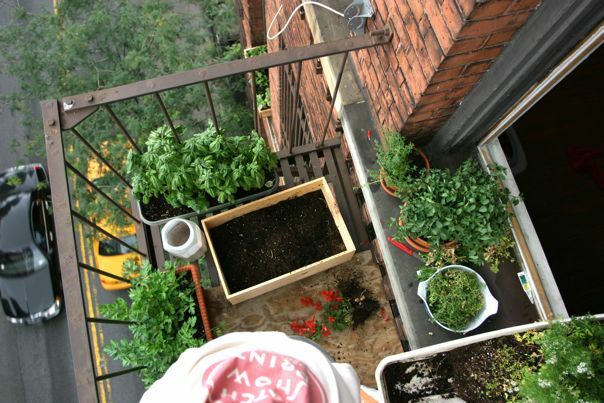 It’s also a good idea to continually sow any herbs like cilantro and basil from which you’d like an ongoing harvest. Late Spring / Summer – you can continue to sow summer plants if you like, but know that there will be a shorter growing season for them. Subscribe to the Radish e-mail newsletter. We'll never spam.